Social Media will play an even bigger role in Academia in the years to come. The real academic research will soon come from social media & analytics. 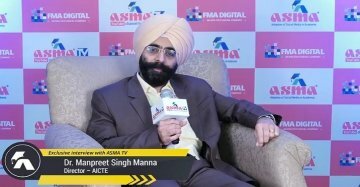 Dr Manpreet Singh Manna (Director – AICTE) speaks to ASMA TV about the upcoming trends in academia, how SWAYAM MOOC will transform education, study habits of millennials, future of social media adoption in education, the importance of innovation in academia, need to drive Gross Enrollment Rate (GER) in India and much more!. We are delighted to have him as Special Guest of Honor at the 2nd Annual Convention & Awards 2018 held at The Leela Palace, Bangalore on August 31-September 1, 2018.